A couple formed by Sagittarius and Aquarius has high levels of compatibility. However, before checking the compatibility, learn a bit more about each of these signs. It is extremely strong the compatibility of Sagittarius and Aquarius, and this is due to the nature of both signs. Aquarius is a sign of air, and Sagittarius is of the element fire. This feature complements them as pieces of jigsaw puzzles that fit perfectly. Aquarius is a fixed sign, and Sagittarius is changeable. Sagittarius life is destined to have great adventures, while Aquarius makes the most of its freedom. 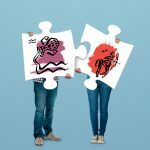 Sagittarius and Aquarius: how will the relationship work? The compatibility between Aquarius and Sagittarius is indestructible. They form a very close couple, and together they enjoy great moments full of new and enriching experiences. Aquarius has a very independent spirit, and Sagittarius loves freedom. These two elements are the basis of the stability of this couple. Both enjoy travelling and Sagittarius takes the chance to expand his knowledge about the world and to have joy and fun. Aquarius will know new and interesting worlds with Sagittarius. This couple can last for a long time together. They could be great friends, as the friendship offered by Aquarius will attract Sagittarius who will always be ready for new experiences. Strong energy moves the communication of this couple. This is because the interests of Sagittarius and Aquarius are quite similar. The communication between the two partners is full of energy that constantly renews them. Aquarius expresses himself through its genius. Sagittarius celebrates his ideas with optimism and great honesty. He will madly fall in love with Aquarius, letting go of the unconventional side that few people understand. This couple can achieve a great future together. The philosophy of Sagittarius boosts the humanism of Aquarius, making them live a deep relationship. The intimate relationship of this couple is quite good. Aquarius is unpredictable and this feeds the libertine soul of Sagittarius, creating even stronger bonds of union. Sagittarius with his intelligence can make Aquarius put aside his independence and choose to share his life. It is a relationship where there will be no monotony, as both are always in search of new experiences. The goals of their lives are similar and this manifests in their intimacy.